We're so happy to share with you an exclusive selection of our images. You can start by CLICKINg through the below thumbnails as a scrolling lightroom - or keep going down to see the entIre collection with captions. All images are taken by Peter Marshall on one breath with no strobes or flashes, all natural light. 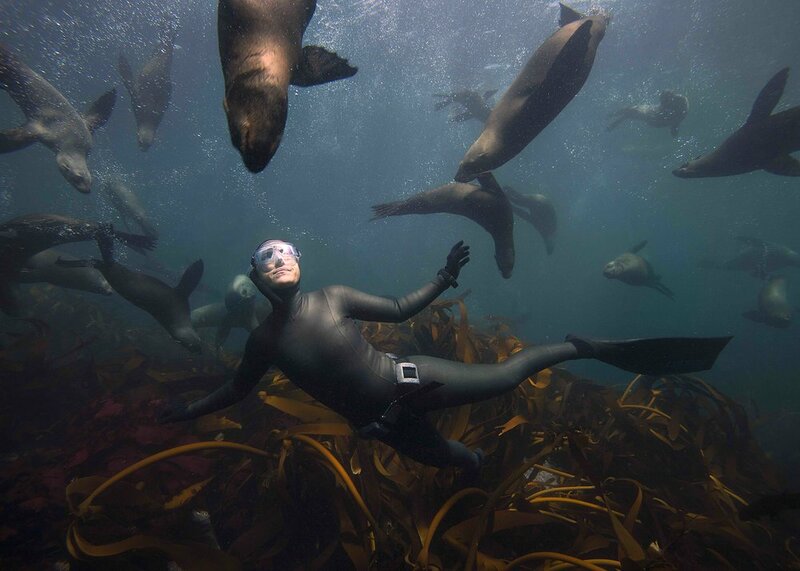 Hanli Prinsloo is the freediver in the images with a human. All images are for sale, printed in cape town on your choice of paper and size - personalised and signed (if you so prefer) before shipping. USD 500 - 800 depending on size and paper choice. Proceeds from the sale will go to the youth ocean workshops of the I AM WATER Foundation. From wing tip to wing tip this oceanic manta ray casts a shadow of herself broad enough for multiple elephants to find rest from the sun. It is not often that animals this large (7.5 meters) move as gracefully as she did, but in the ocean we find grace often. We dove with her over a period of three hours as she came in and let us feel her shadow rest on us as she hovered above. Then she would quietly glide away only to swoop around and return for another lap. The elegance with which an animal of her size moves and the lines her body forms as she does is only possible in a watery world. A breath of the sky allows us to visit the life below the surface of the deep where we witness the life of swarming oceans. A swarming tornado of life encloses around us, folding us inside. The swarm opening to usher us back to our world of sky and air. The more time we spend in an environment, whether natural or artificial, the more our bodies begin to take on the characteristics of our surroundings. 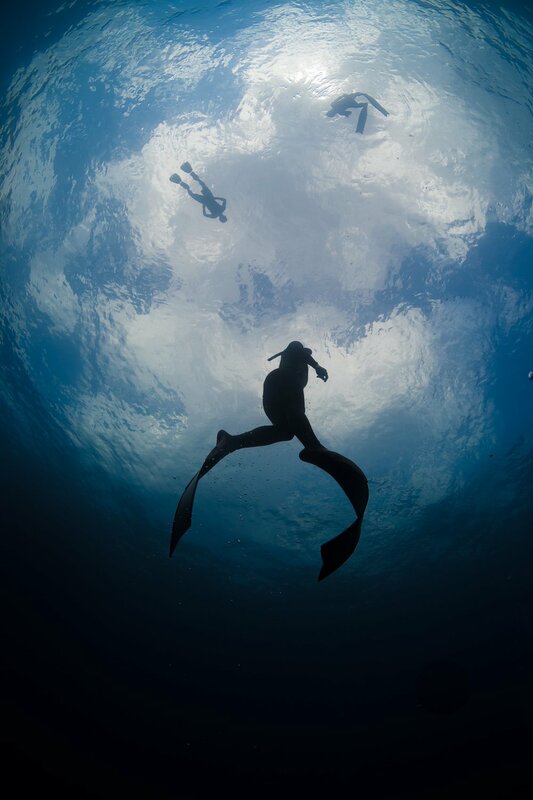 In the oceans our lungs compress, expand and stretch as we spend time underwater. Our heart rate slows and our thoughts follow. The movements of our extremities grow graceful. Before we know it we sway just as the kelp we swim amongst. The light caught at the surface pulls your attention as you breathe. Once the lungs are filled the descent begins beneath the golden leaves to the forest below. The surface draws us down to where the other world begins. Thick enough to crawl over and strong enough to assist your hand’s pull as you descend through the tangle of kelp stalks below. An exercise in wonder and play. 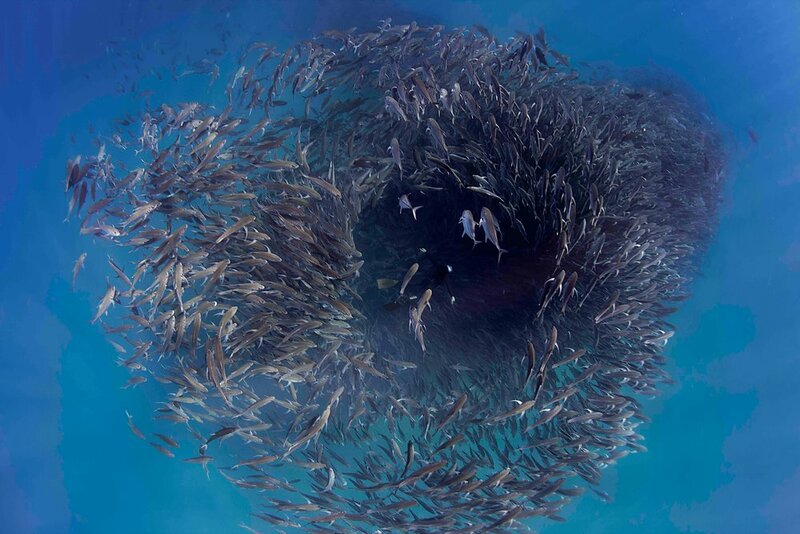 The mass of ocean life envelopes you in no way more directly than in Cabo Pulmo, Mexico. 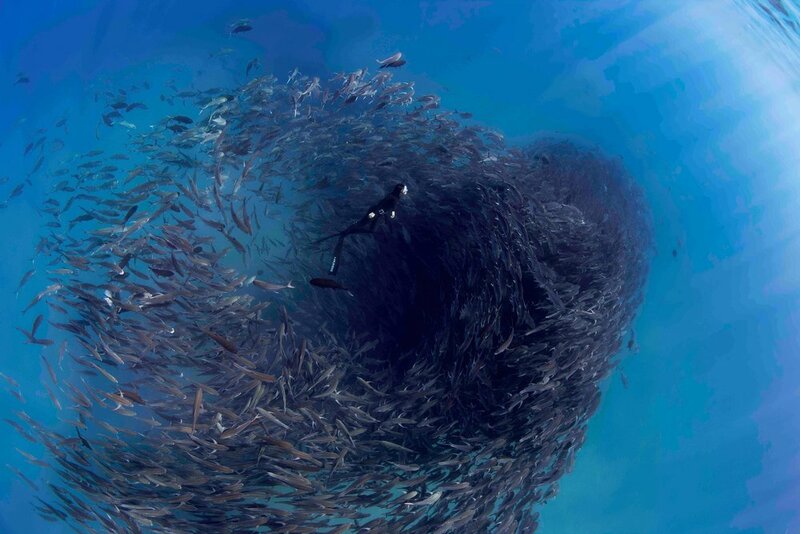 A sanctuary for marine life, the ecosystem has responded in kind by swarming with swarms of fish. From 20 meters below, an area the size of an Olympic Swimming Pool can be a solid living, shimmering body of fish. 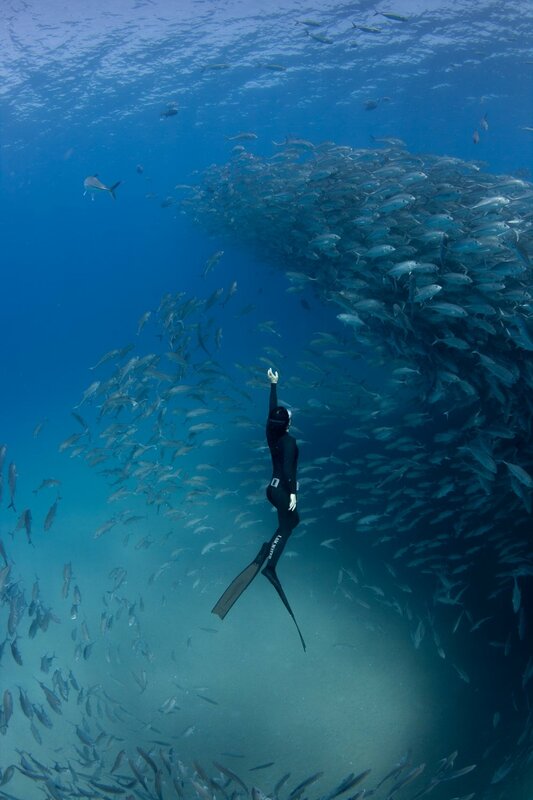 As a freediver we experience these jack fish as if being immersed in a second sea of life, completely enclosed on all sides by the synchronized movements of marine life. “We have an audience now,” they must have thought to themselves as they noticed us slipping into the water. 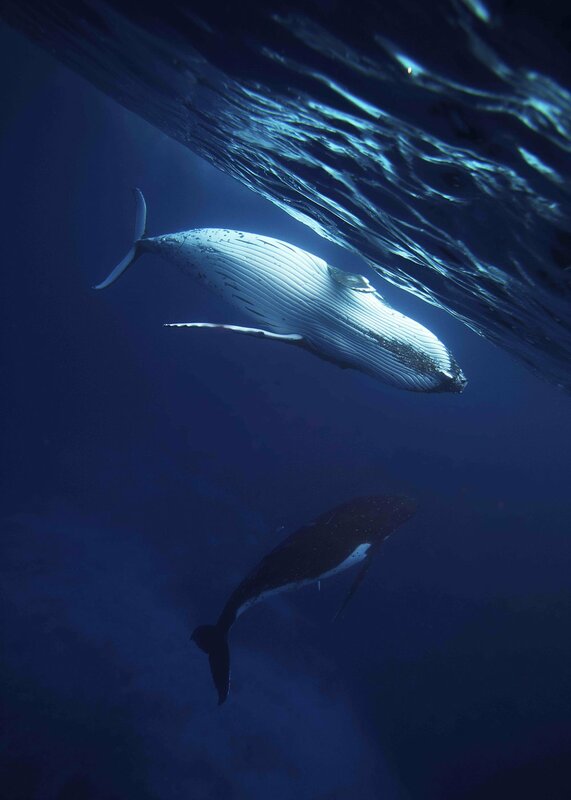 When these two male humpbacks about one hundred meters away noticed us, they stopped their wallowing, swam over to within five meters of us, and began playing and rolling and splashing just a whale’s length away. 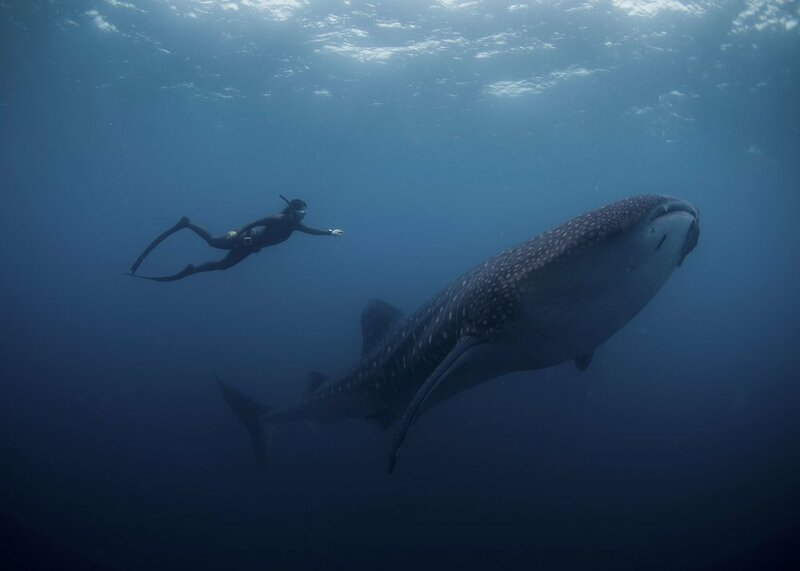 This giant of the deep surprised us in Ecuador while searching for manta rays. The water was milky with plankton as this large whale shark rose directly beneath us. A slow motion tail swept it closer as Hanli was able to gently share this moment. As slowly as she rose to join us she disappeared into the plankton as if her questions had been answered. Humpback brothers wallowing in song. As you enter, the water is full of song; the sound waves move directly through your skin, into your organs, out the other side as they continue through the ocean’s waters. Hanli returns to the world above the water’s surface. Surrounded with the exhalations of seals, the underwater maneuvers and bendable spines of the seals occupy all one’s aquatic senses. Out of each eye there are circuses of performances taking place. All worthy of applause. Below the ocean’s surface lies another world, another planet. One planet above with its rules and customs and another below. Above, our bodies plod along weighed to the earth - restricted by heavy limbs, bound to the ground. Below, our bodies have new potential. We simply need to slip below the waterline. Our favorite seals in Cape Town are acrobatic and mischievous animals. The moment you turn your back to them they gather together and plot how best to nibble your fins and playfully assert their aquatic dominance. 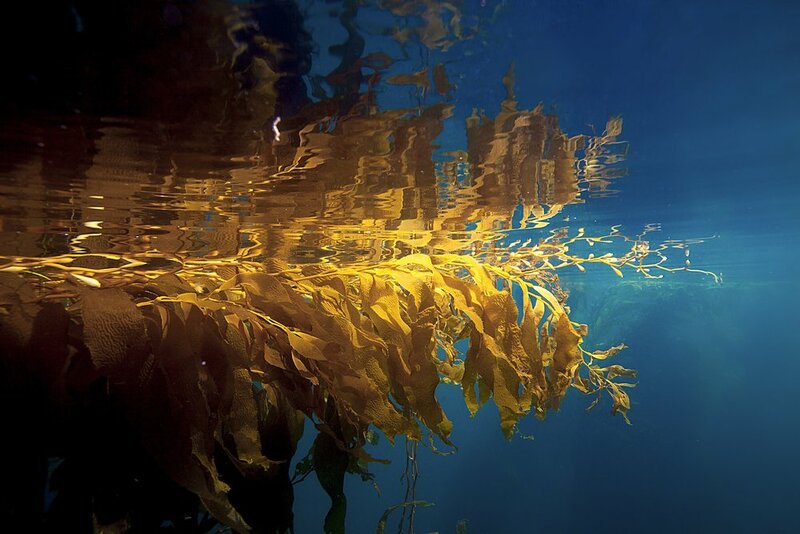 The thick tangle of kelp fronds reminds me most of crawling through the roots of bushes as only a 6 year old child can. Crawl spaces just big enough for a child’s body to squeeze through that open into a sitting spot all to oneself. 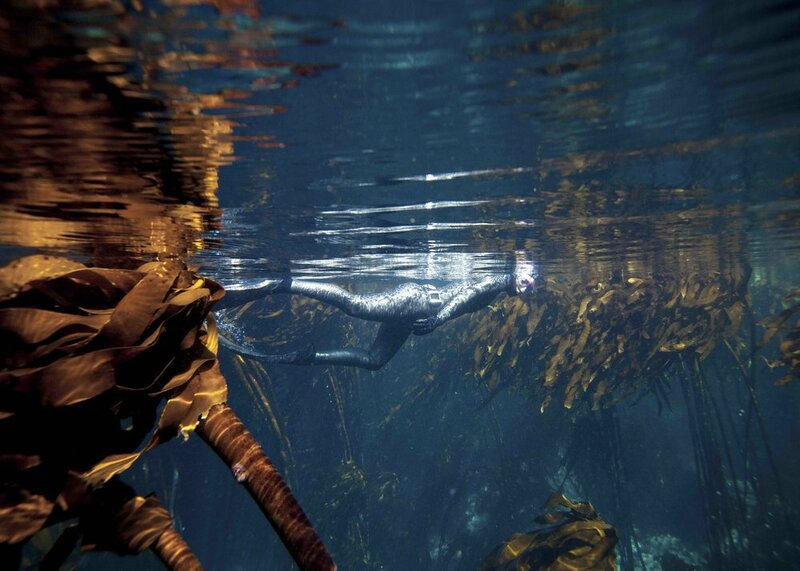 Underwater the kelp forest gives our bodies the ability to not only glide through tight spaces, but swing in flight from stalk to stalk as we fly between patches of light and solitude. As a child and now as a grown child I love the story of Peter Pan. Not simply because of the namesake, but because of the notion of human flight. 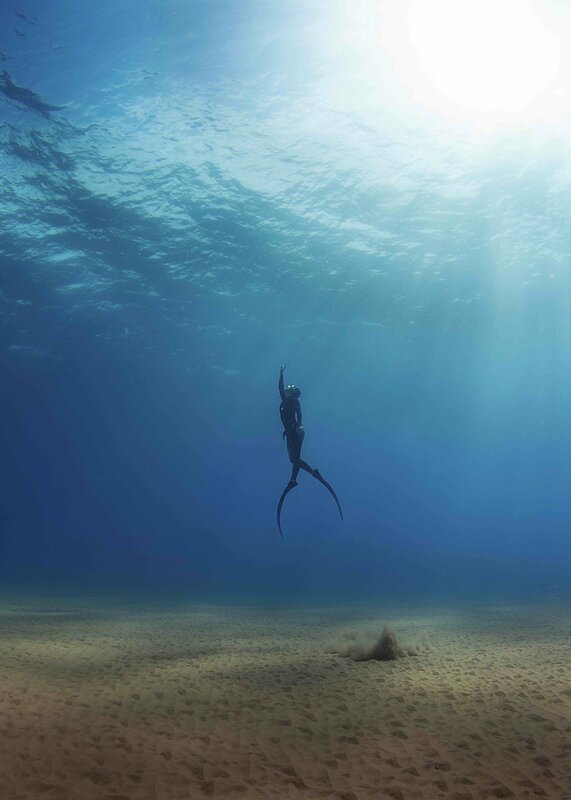 As a freediver I feel we come as close to the feeling of flying as anyone can. Moving in three dimensions wherever the human body allows, without the restrictions of gravity as we know it, this is where the make believe meets real life. Below the surface, below the life, a metropolis shimmering above. Moving in ever-changing sculpted shapes. Collective thoughts in tangible movement. Hanli returning to the surface through the jack fish in Cabo Pulmo. From 20 meters below she begins her ascent up through the collection of fish - silently gliding through their column as she watches their movements respond to hers. Gifted with a talent for play. Never before have we encountered a more youthful energy and acrobatic displays of underwater flying. Here Hanli comes face to face with a mother and her new born calf. They sought Hanli out for a fly by of somersaults and loops. They thoroughly enjoyed her ability to participate and continued inviting us back into their world of flight. 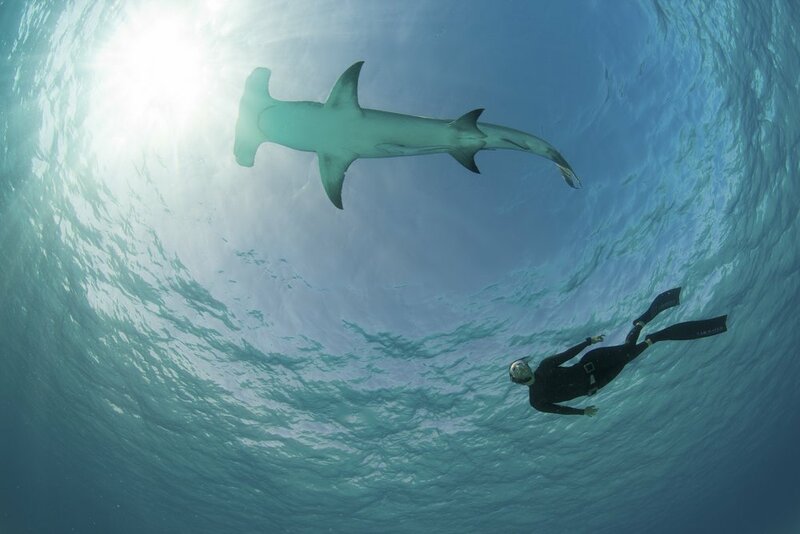 This Great Hammerhead in The Bahamas felt at ease with Hanli enough to allow her to swim underneath and belly to belly. Both Hanli and the shark communicating trust to one another. Notice me. Not every interaction with ocean animals is intimate. They are not a wind up toy, a play thing, made for our entertainment. They are their own, and we do our best to share space without expectations in respect. Chest open and direct, presence is made known. An adjusted turn in response communicates apparent words between human and shark. 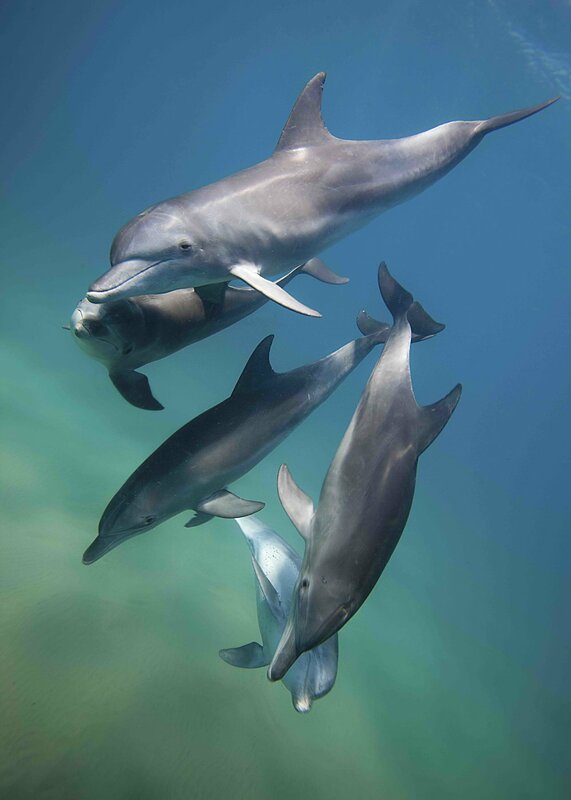 Three dolphins playfully attend to entertaining us in the waters off Mozambique. 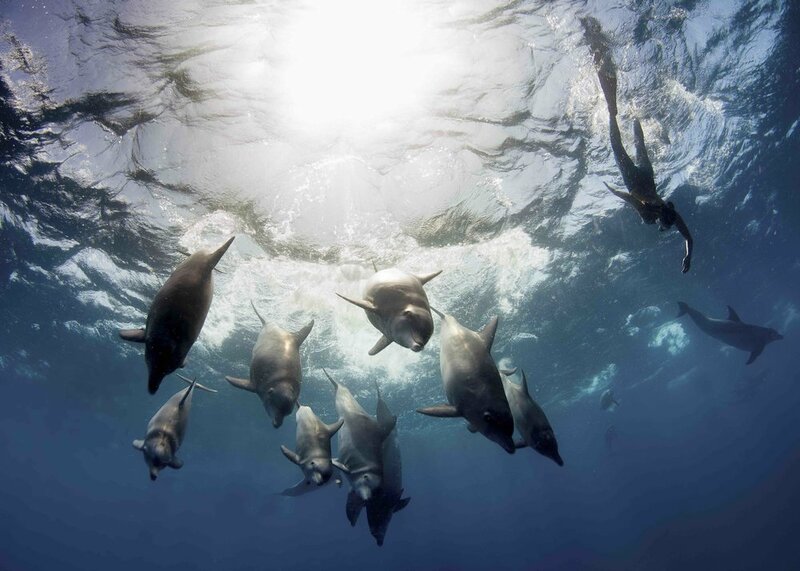 As if it were their solemn duty to play, we frequently find dolphins surfing waves, jumping through the ocean’s swell, and swimming around us in tight, excited circles welcoming us to their games. Alien looking tribes of indigenous life inhabit our oceans. Hanli enjoying her moment of underwater flight with a representative from one of the native tribes of our planet. Her intelligence told through her gaze back at mine. Mine debating whether the other is self conscious, aware, sentient, scientifically justified. Hers curious, present, constant, soft, and forgiving. We search for foreign intelligence throughout the cosmos and overlook the intelligent wild animals with whom we share this planet. The foreign shape of the great hammerhead conjures fear and curiosity. Once we learn the subtle communication of body language and presence, we slowly gain the trust of even the most other of ocean creatures. On an island just off the coast of Ecuador a congregation of oceanic manta rays occurs when currents and conditions converge. The island is surrounded by a flock of underwater giants soaring through space between the ocean’s surface and sea floor. Diving deeper with the pod of dolphins in Mozambique, Hanli joins in their synchronized descent to the waters below, a member of the pod. At over seven meters from wing tip to wing tip, you make that one breath last as long as you can - in awe. A playful envoy of friends. They must have heard my movements and noticed who I was. They know how to play and assume I do too. Time to remember how. Smooth and precise along the sand bottom. No sand disturbed, the pattern remains intact. Only the necessary water molecules moved.